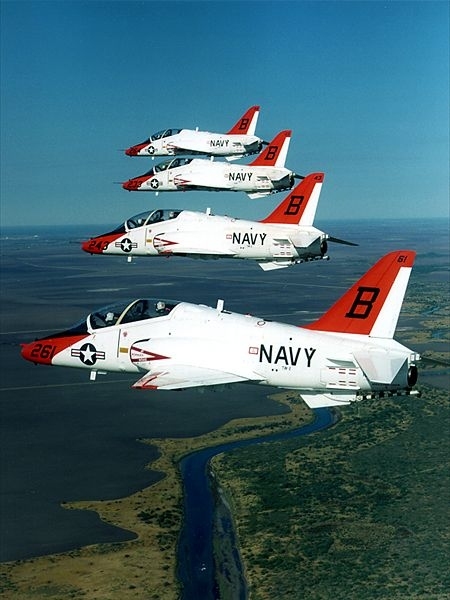 Formation of four T-45s from TW-1, NAS Meridian. The T-45 is a rare example of the US Armed Forces adopting in large numbers an aircraft of non-US origin. This must be considered a very positive endorsement for the Hawk jet trainer, from which it was originally derived. 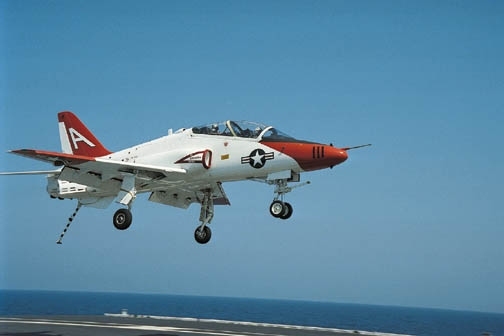 However, during it’s protracted development the T-45 has evolved into a training aircraft with virtues which are significantly different from those of the Hawk. In the late 1970s the US Navy began formulating the requirements for a new training aircraft to replace the faithful but ageing T-2C Buckeye intermediate trainer and TA-4J Skyhawk advanced trainer. The new aircraft would form part of a fully integrated training system for undergraduate jet pilots – including aircraft, simulators, training aids and logistics support to be furnished by a single contractor. The programme was called VTX-TS, meaning Heavier than air, Training aircraft Experimental – Training System. In January 1978 British Aerospace and the Douglas Aircraft (DAC) division of McDonnell-Douglas Corporation (MDC) agreed a teaming arrangement to compete for VTS-TS. McDonnell-Douglas and British Aerospace were already co-operating very successfully on the Harrier II, and so MDC was a natural US partner for the new programme. In late 1978 BAe and Dassault-Dornier were awarded contracts to study the required engineering changes for Hawk and Alpha Jet carrier operations respectively. Early in the evaluation the Hawk demonstrator, ZA101/G-HAWK, had paid a 31 day visit to the USA, during which it flew a total of 85 evaluation sorties. On 18 November 1981 the proposed naval Hawk variant was declared the winner and assigned the designation T-45. The Hawk chosen on the basis of its flying quantities, design maturity and low fuel consumption. Mcdonnell-Douglas Corporation (MDC) was designated the prime contractor, with BAe responsible for the airframe, Rolls-Royce for the engine and Sperry for the simulators. Following completion of detailed engineering design, full-scale development was launched in mid-1984, for the production and flight testing of four pre-production aircraft. To speed up introduction into service, it was initially planned to buy 54 non-carrier capable minimum change T-45B versions, before moving on to the more extensively modified T-45A. After review it was decided that producing all aircraft as T-45A models would give better overall value for money, at the cost of a short programme delay. The T-2 and TA-4J trainers remaining in service received life extension programmes to bridge the gap. Changes from the standard export Hawk Mk 60 comprised a deeper profile forward fuselage to accommodate a new stronger twin-wheel nose landing gear, with catapult launch bar and improved nosewheel steering; new long-stroke main landing gear stressed to withstand carrier deck landings; main landing gear doors sequenced to close after wheels locked down; twin lateral perforated air brakes on the sides of the rear fuselage, in place of the single ventral air brake; a substantially strengthened airframe and intermediate engine casing; revised US Navy standard cockpit instruments and radios; On-Board Oxygen Generation System (OBOGS) and Martin Baker Mk 14 NACES ejection seats. SMURFs (Side-Mounted Under Root Fins) – small curved surfaces mounted ahead of and below each tailplane – provided a beneficial aerodynamic tweak which was soon introduced on the Hawk Mk 100 and Mk 200. The resulting aircraft was renamed ‘Goshawk’ to avoid any possible confusion with the US Army Hawk missile. The first development T-45 aircraft (BuAer. 162787), Ship 1, was rolled out at Long Beach, California, on 16 March 1988, and made it’s maiden flight on 16 April. A second development aircraft (BuAer. 162788) followed in November 1988. These two aircraft have sometimes been erroneously referred to as YT-45s. Flight testing was carried out at Yuma, Arizona and then at NATC Patuxent River, Maryland. 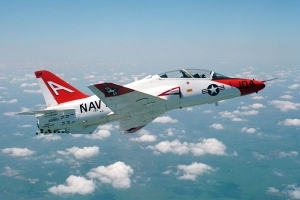 Although the T-45 met the original VTX requirements, detailed operational flight testing and evaluation by NATC identified a number of performance and flying shortcomings which would adversely affect its ability to safely conduct day-to-day training operations. Accordingly a modification programme was put in place to rectify the perceived deficiencies. The F405-RR-400 turbofan originally fitted, (a derated version of the original 5,450 lb st (2472 kg) Adour 861 engine), was replaced by the 5,845 lb st F405-RR-401, based on the Adour 871 used in the Hawk 100 and 200. The -400 engine had been derated to meet Navy demands for fuel economy and longevity, but it was determined that more thrust was needed in the critical high drag carrier approach configuration. Full-span wing leading edge slats were added, (to improve stall characteristics), and the wing-tips squared off, while a 6-inch (0.152 m) extension to the tail fin was added, and an increased span tailplane with squared tips fitted. A single ventral fin was added in front of the arrestor hook hinge fairing. Control harmonisation was also improved, and airbrake/tailplane movement interconnected. While these modifications were being developed, design responsibility for the T-45 was transferred from Douglas at Long Beach to McDonnell-Douglas at St Louis. Although lack of design capacity at Douglas was cited as the main reason, the political and technical benefits from bringing in experience accrued from development of the F/A-18 naval fighter-bomber undoubtedly influenced the decision. 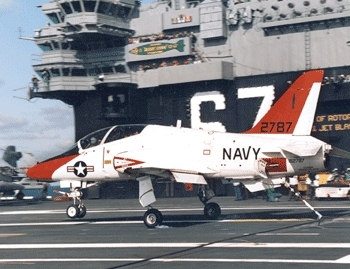 Flight testing of the modifications at NATC from September 1990 showed a marked improvement in handling characteristics, and on 4 December 1991 the first pre-production aircraft conducted a successful series of carrier trials aboard the USS John F Kennedy. At this time the T-45 test fleet consisted of the two original (Long Beach built) Full Scale Development (FSD) aircraft with interim uprated F405-RR-400A (Adour 861) engines, and two (Palmdale built) Pre-Production aircraft (BuAer. 163599 & 163600) with F405-RR-401 (Adour 871) engines. On 16 December 1991 the first St Louis built T-45A achieved its maiden flight. Built to full production standard, this aircraft was formally handed over to the US Navy on 23 January 1992. Introduction of the type into service at NAS Kingsville, Tx, with VT-21, commenced soon afterwards. As required under the contract, this process involved delivery of simulators and training facilities to Kingsville, conversion of the flying instructors to the new aircraft and the new curriculum, and putting in place the contractorised maintenance organisation to support the aircraft. Undergraduate training on the new type commenced in early 1994, and on 11 February 1994 the first student pilot flew in the T-45. 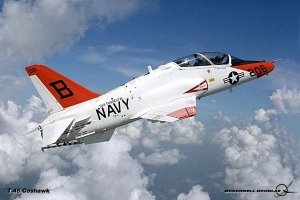 The first class to earn it’s wings on the T-45 graduated in October 1994. Further development of the T-45 has continued. One production aircraft (BuAer. 163635) was fitted with an experimental digital ‘glass’ cockpit known as Cockpit 21. Many of the normal dials on the instrument panel were replaced by two monochrome Multi-Function Displays (MFDs) in each cockpit to better represent the type of cockpit now seen in modern front-line aircraft. Additional avionics include a MIL-STD-1553B databus, Rockwell Collins GPS and a Litton ring laser gyro INS. Flight trials commenced on 19 March 1994, and were sufficiently successful that the change was adopted on the production line from the 73rd aircraft (BuAer. 165081). Aircraft with Cockpit 21 are designated T-45C, and it is anticipated that all production T-45As will also be retrofitted to this standard and redesignated T-45C. A proposal to modestly increase fuel capacity, through the use of fuel tanks in the air intakes was dropped. 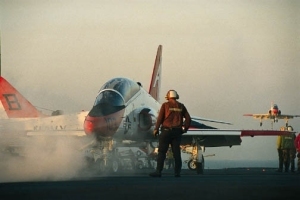 However, US Navy dissatisfaction with some aspects of the F405 engine led in 1996 to one T-45A being fitted with an AlliedSignal F124 engine for flight testing. The F124 engine was offered to some potential T-45 export customers, particularly Australia, but not taken up. The US Navy’s engine concerns were eventually tackled by an F405 engine modification programme put in place by Rolls-Royce. T-45s now in service are based at NAS Kingsville, Texas and NAS Meridian, Mississippi. The aircraft are permanently based ashore and flown out to the training carrier for deck landings. Since the transition to the T-45, the training task has been accomplished with 25% fewer flying hours, using 42% fewer aircraft and 46% fewer personnel. With the current T-45 training demand, the U.S. Navy has been averaging more than 60 hours per month per airframe – one of the highest utilisation rates in the world. VTX-TS Initial US Navy requirement designation. T-45A Pre-production development aircraft for flight testing. Initially without wing leading edge slats. T-45A Initial production version. Fully carrier capable. Full-span wing leading edge slats. Later upgraded to T-45C standard. T-45A One aircraft temporarily fitted with AlliedSignal F124 engine for flight testing. T-45A One aircraft with digital cockpit as ‘Cockpit 21’ demonstrator. T-45(AN) Version offered to the French Navy in 1991. Cockpit 21 plus additional advanced avionics. Not built. T-45B Planned non-carrier capable version. Minimum change version of Hawk Mk.60 for early service entry. Production of 54 planned, with first fight expected February 1987. First two aircraft to be wholly built in the UK. Requirement cancelled and not built, although offered to potential export customers. T-45C Improved production version of T-45A, featuring ‘Cockpit 21’ with digital ‘glass’ cockpit with 2 colour MFDs. 1975 US Naval Air Development Center (NADC) studies replacement of T-2C and TA-4J by single VTX aircraft. May 1977 BAe presentation to US Navy on Hawk aircraft. December 1979 Request for quotations for VTX-TS proposals issued. January 1980 MDC and BAe agree to team for VTX-TS. June 1981 Hawk demonstrator (ZA101/G-HAWK) tours the USA. 19 November 1981 Hawk wins VTX-TS competition. T-45 designation assigned. 1982 Proposal to split production into ‘minimum change’ T-45B followed by carrier capable T-45A. late 1983 T-45B variant cancelled. October 1984 Full Scale Development contract for T-45A launched. February 1986 Construction of two pre-production ‘prototypes’ begun. May 1986 Engineering Development contract signed by MDC. 26 January 1988 Initial production contract for 12 T-45A aircraft agreed. 16 March 1988 Roll out of first pre-production T-45A (162787) at Long Beach. 16 April 1988 First flight of T-45A (162787). 2 November 1988 First flight of second pre-production aircraft (162788). 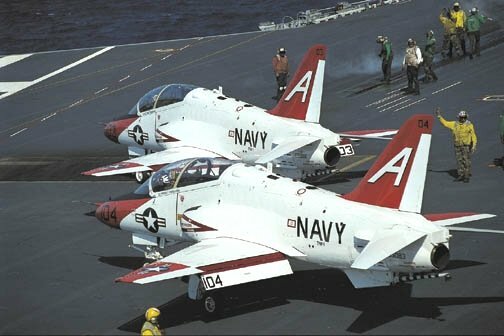 November 1988 First US Navy evaluation flights. 1989 US Navy outlines ‘big 5’ deficiencies found in flight testing. October 1989 Initial planned first delivery for T-45A. Not achieved. 19 December 1989 Design Authority moved from DAC, Long Beach, to McDonnell Douglas, St Louis. September 1990 Start of flight testing of production standard slatted wing. 4 December 1991 First carrier landing and catapult launch trials conducted on USS John F Kennedy. 16 December 1991 Maiden flight of first (St Louis assembled) full production standard T-45. 23 January 1992 First production aircraft handed over to the US Navy at St Louis. 1992 First T-45A delivered to NAS Kingsville, TX (to VT-21). 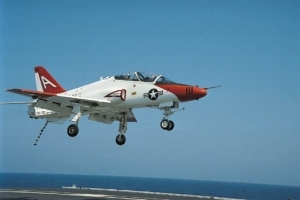 11 February 1994 First flight by a US Navy student pilot in a T-45. 19 March 1994 First flight of ‘Cockpit 21’ demonstrator. 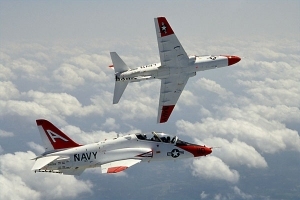 5 October 1994 First class of pilots trained on the T-45 graduate. 17 January 1995 Authorisation of full-rate production for T-45. 7 October 1996 Flight testing of T-45A fitted with AlliedSignal F124 engine commences. 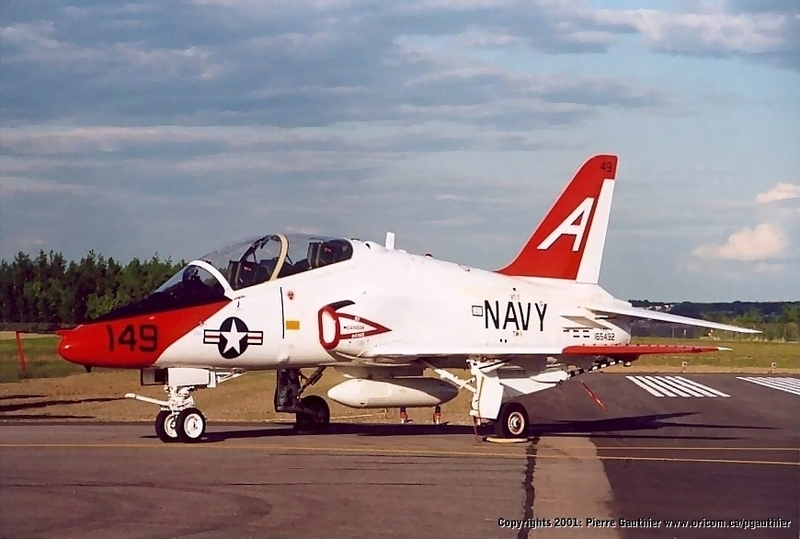 31 October 1997 First T-45C presented at St Louis (73rd production aircraft). 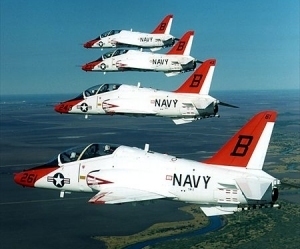 15 December 1997 T-45C introduced into US Navy service (at NAS Meridan, MS). 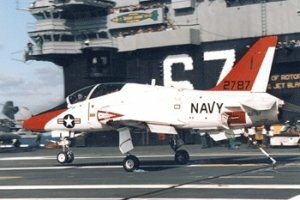 July 1998 Start of student training with T-45C (with VT-23). 2002 Start of programme upgrading T-45A to T-45C standard. 2007 Planned completion of T-45A upgrades to T-45C. Armament: One hard point under each wing for carriage of practice bombs, rocket pods or drop tanks with 156 US gal (591 lit) of fuel each, plus one under-fuselage centre-line pylon for use in weapons training role. Design Authority: Boeing Military Aircraft, St Louis, MO. * plus one fatigue test airframe and one for drop testing. ** planned production, at 12 aircraft per year. Subcontractors: Wings (BAE SYSTEMS, Brough), Centre & Aft Fuselage (BAE SYSTEMS, Samlesbury), Fin & Tailplane (BAE SYSTEMS, Samlesbury? ), Windscreen and Canopy (Hamble Aerostructures). * Includes a section on the early stages of T-45 development. * Includes two chapters on the T-45. Good photos. * Includes ‘Focus Aircraft’ feature on the Hawk, including the T-45. * Includes a section on the early days of the T-45 programme. * Includes detailed entry on the T-45. merci pour ces explications très intéressantes. thank you for these very interesting explanations.